The Paralympic Games, also referred to simply as Paralympics, are probably the main international multi-sport event for athletes with disabilities. 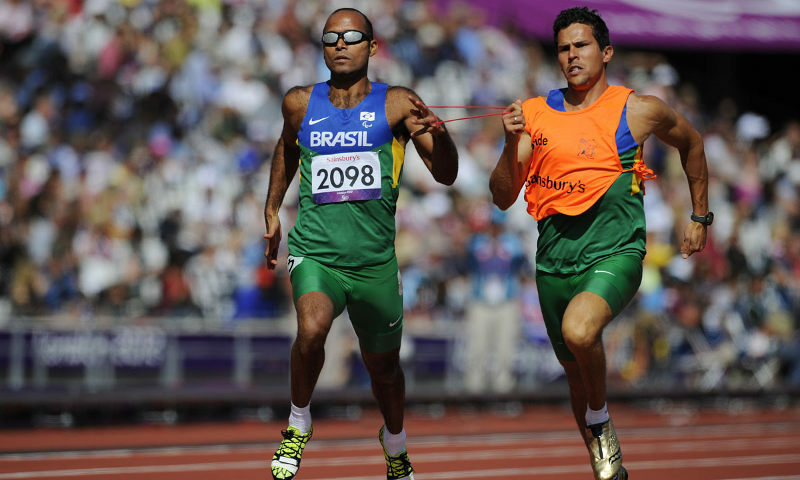 Athletes compete in several categories, depending on their disability : impaired muscle power, impaired passive range of movement, leg length difference, limb deficiency, hypertonia (damaged central nervous system), short stature, athetosis (involuntary writhing movements), ataxia (neurological disorder affecting coordination), vision impairment and intellectual impairment. Paralympics are held every four years immediately after Summer and Winter Olympic Games. Disabled athletes were able to compete in the Olympic Games almost immediately after their inception but they were the exception rather than the rule. The idea for “Olympic Games” for athletes with physical disability was born in the late 1940s when the first organised sports event for physically disabled athletes was held (on the day of the opening of the 1948 London Summer Olympics). Conceived and organised by German-born Jewish doctor Ludwig Guttmann (1899-1980) at the Stoke Mandeville Hospital in Buckinghamshire, the International Wheelchair Games (the later Stoke Mandeville Games) are widely regarded as the precursor of the Paralympics. Originally competed by the British World War II veterans with injured spinal cord, the 2nd Stoke Mandeville Games were joined by the Dutch veterans, making the Games the first international sports event for physically disabled athletes. The 9th Stoke Mandeville Games that were held in 1960 in Rome, the host of the 1960 Olympic Games are considered the first modern Paralympic Games. Unlike the 1948 Games, the 1960 Games were no longer open only to veterans but other disabled athletes as well albeit only to those in wheelchair. Other disabilities groups were added at the 1976 Paralympic Games and the number of competing athletes increased by four times. At the 1976 Games that were held in Toronto, as many as 1,600 athletes competed as opposed to 400 athletes that took part of the 1960 Paralympics in Rome which were officially called the International Wheelchair and Amputee Sports (IWAS) World Games. New disability categories were added over the following years until reaching today’s ten categories. Since the 1988 Seoul Games, Paralympics are held directly after the Olympic Games in the host city of the latter. The Winter Paralympic Games are held since 1976, initially every four years in the same year as the Summer Games. Since 1994, they are held in even numbered years separate from the Summer Games, just like the Winter Olympic Games.